I had to make a Costco run the other day. I couldn’t put it off any longer. We were running out of toilet paper and it is such a good value there that I refuse to buy it anywhere else. Apparently, I’m not alone in this. I just learned that Kirkland Signature toilet paper is Costco’s number one selling item. Makes sense. We all need it and Costco is serious about it. They actually conduct research on it. I’m not privy to what their testing entails but I’m not sure I would want to know anyway. I didn’t have a long list so I thought it would be a quick in and out. 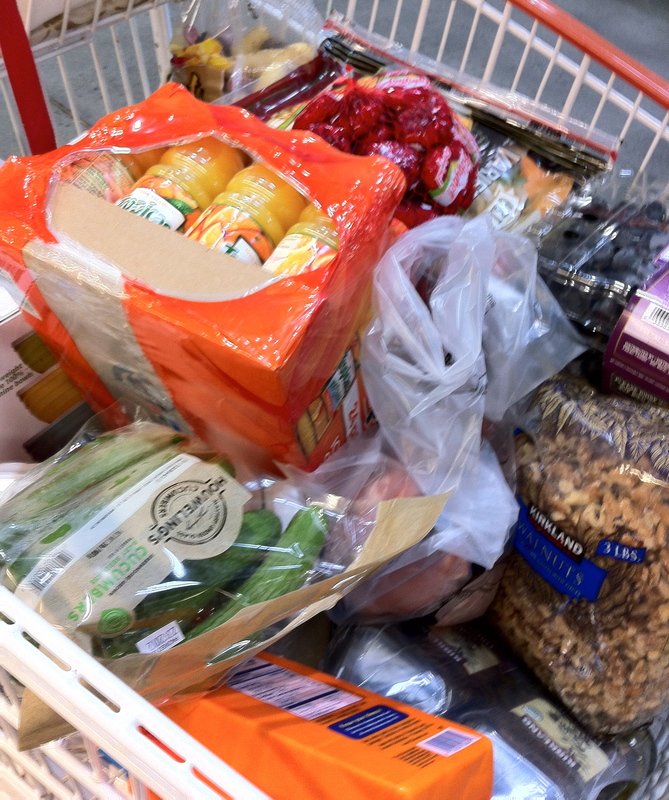 How much can a household of two need at Costco anyway? Two hours and $440 later I got home. You know how it is. When it’s not that crowded you can look around better and buy a lot more stuff that you don’t really need. My strategy is to get there just as the store is opening. Costco is well stocked but it always runs out of parking places. Somewhere around 3 million people shop at Costco everyday. Some days it looks like all 3 million are cruising my Costco. I make it a point to never, ever go near a holiday weekend. The aisles get gridlocked and the shoppers get hostile. You can get hurt. Once I was hobbling around the store with an orthopedically attired broken foot and some idiot drove their cart right over it. 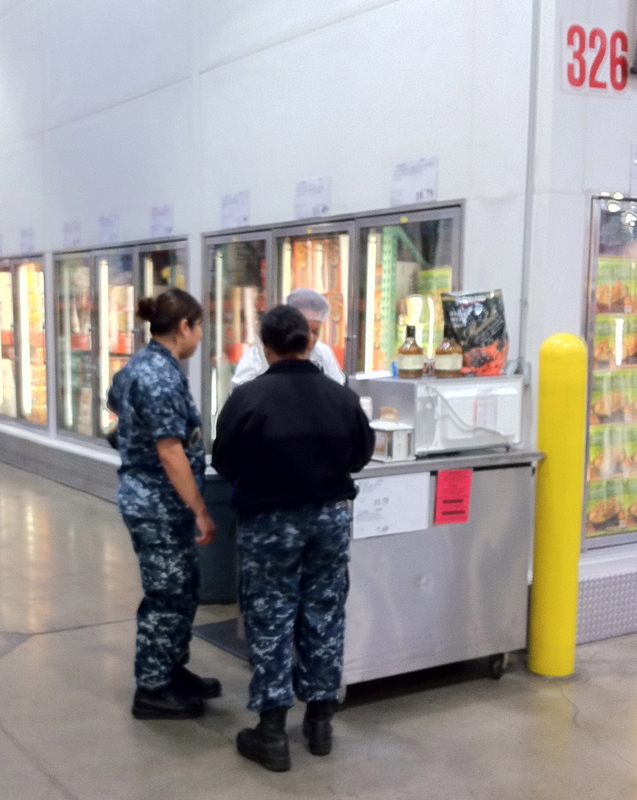 Even the Navy shops at Costco! myself. On the plus side of the day, only one person smashed their cart into me. It would have really annoyed me but I reminded myself that I must make allowances for all the extremely important people in the world who are engaged in urgent phone calls. It is not, after all, all about me. This was reinforced to me as I did not receive an apology. At least I had some sturdy shoes on to protect my toes. The biggest altercations this trip took place in the parking lot. There was a near deadly duel for a parking space which provided some entertainment. It got a little ugly. There were words and gestures traded as the tension mounted but in the end there was neither violence nor dented fenders. I also watched a woman stubbornly block the entire parking lane and refuse to move. Horns blared all around her as she waited for a couple to load up their stuff and pull out. Then ,when the couple finally finished loading, they locked up their car and went back to the store for a hot dog. We are big on lunch at Costco here in California. This trip’s haul consisted of a lot of party food and an embarrassing amount of alcohol. Our adult kids will all be in and out of town throughout the summer and I am now well stocked. I was satisfied with a job well done. I even managed to find room to store it all. So what if I have paper towels squirreled away all over the house. If it rains while the grandkids are here we can make a game out of finding them all. I do love all the stuff I can get at Costco but I’m hoping I won’t have to go back anytime soon. Quite honestly, I’d rather go to the dentist. Hahahahah! This is all so hilarious- and so on point! I’m convinced that there should be Costco insurance coverage, and possibly even a reality show for all the parking lot fights. I think the hot dog story made me laugh so hard my neighbors heard. Haha love this! Insurance is a great idea! How about we get coverage for both inside and the parking lot. I think we all love Costco and hate ourselves for being drawn there and for purchasing much more than we can use in any given timeframe. Now that we have a Fresh Market at the beach we can buy small amounts of food for very high prices thus giving a balance. Ha! Your comment about balance cracks me up. It is so true! There is no winning the game is there? I hide the paper towels in various cupboards too!